Holi – Is an ancient spring festival also known as the festival of colours and sometimes the festival of love. Holi is one of the few Indian holidays that my family never celebrated when we were growing up, for some reason my parent’s just weren’t into it. Of course, that doesn’t mean I wasn’t completely enamored with idea of Holi as it was portrayed in Bollywood films. People running around the streets throwing powdered colour at one another, singing, dancing and quite often falling in love. Sounds perfect to me! This year I wanted to do something to celebrate Holi, the arrival of spring, and just bring a little of the spirit into our home. A few fun ideas I came up with after reading up on Holi were; making pinwheels for Zara’s class, doing some splatter art on a canvas (we are going to do this on Sunday! ), buying pink bangles – which is tradition in Rajasthan, and of course; taking a shot at making Thandhai. 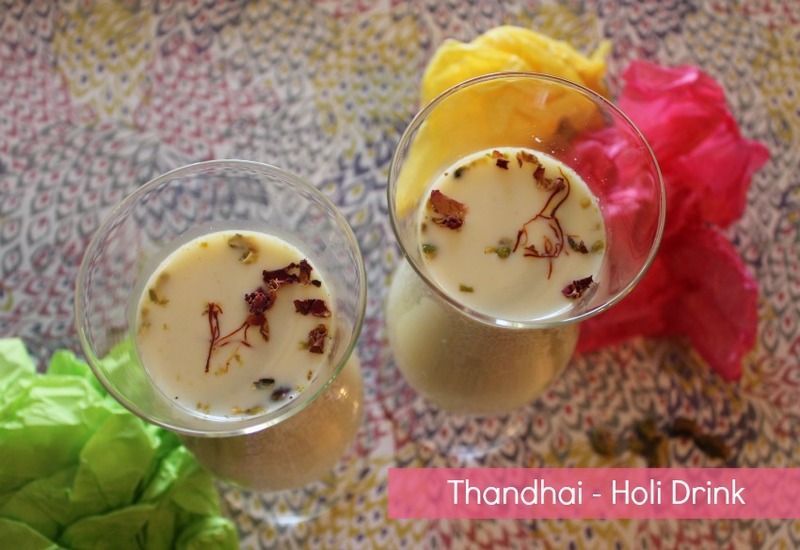 Thandhai is synonymous with Holi. A milk based drink, spiced with a whole lot of nuts and flavourings, it is often served spiked with ‘bhang’ (cannibas) during the Holi. Of course I wasn’t trying to get my family high – so I went with a non-alcoholic version, and then also created a milkshake version for the kids. I have to admit though, this recipe was tough for me; there were a lot of ingredients I don’t usually use (or have in my pantry), and I’ve never tasted Thandhai before so I had no idea what kind of flavour I was trying to create. It didn’t help that like many Indian foods when I started to do my research there was a lot of steps where it is was ‘assumed’ that the cook would know what to do, and many of the measurements were vague (a fistful of pistachios, fennel to taste, etc.) My first two batches were not good, but with some tinkering and tweaking I created a recipe that works for my family and is officially my first self created Indian recipe to pass on to my kids. Before I give you the ingredients and directions, I have to say; don’t let the long list of ingredients scare you away. Most were available in the bulk section of my local Indian grocery store so I didn’t have to buy large quantities. Also, most recipes called for a lot heavier flavouring than this, but I found anymore ‘stuff’ than this to be too strong for the hubby and I. 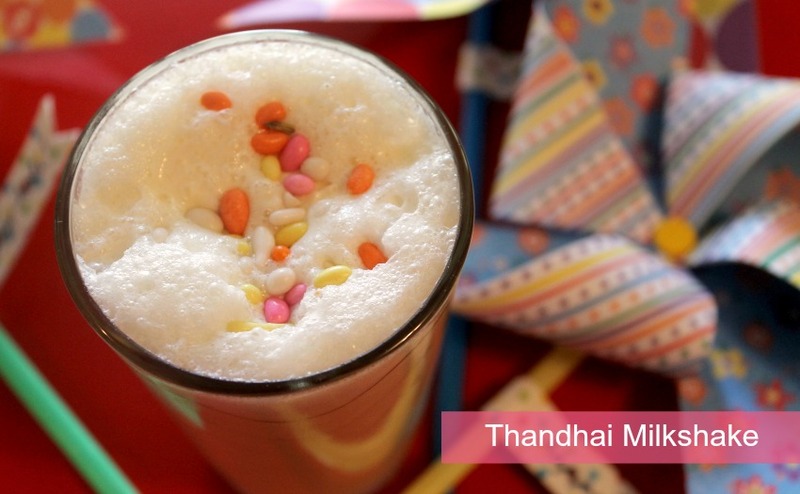 Read below for my Thandhai recipe and a fun trick for the kids – Thandhai milkshakes. *I didn’t see any recipes that call for salt in Thandhai and that might be because some people fast on holidays and you are not supposed to eat salt during a fast. For me the salt totally elevated the taste of this drink. 1. Set the melon seeds and poppy seeds in a little water for 2 hours to soften. Do the same for the almonds but in a separate bowl (I learned through experience that the poppy seeds stick to the almond skin which is going to be removed later which is a pain). 2. While the almonds and seeds are softening, warm up the milk slightly and dissolve the sugar in it (do not let it boil). Set is aside to cool. 3. Make a smooth paste out of your almonds, pistachios, cashews, melon seeds, poppy seeds, black pepper, cardamom and fennel in the mixer. You may need to add a little bit of water to get them to mix together well. 4. Add your rosewater, a few strands (I used 6) of saffron, and salt to the cool milk; mix thoroughly. Add the flavouring paste to your milk and put it in the fridge for two hours. 5. This part is probably totally wrong and faux pas, but after two hours I strained the paste out of the milk because the Thandhai flavour was strong enough for us. I think you are supposed to leave it in the milk, but I didn’t like that texture or the flavour when I left it. Serve it up in some fancy glasses, topped with a few strands of saffron and dried rose petals. If you want to spike your Thandhai, Mr. T recommends adding a little rum to it. Me I’m going to stick with enjoying all the various flavourings. So the kids didn’t really dig the Thandhai as is – it was still too strong for them. To remedy this, I basically used 1/2 a cup of Thandhai for each shake and balanced it out with ice cream and a little more rose water and they were a hit.Top with a little mithi sonf (fennel candy) and you are ready to party. Okay so I know this post is already very long, but I have to tell you … if you have leftover Thandhai, steep some orange pekoe tea in it (not in the milkshake version of course). I’m drinking Thandhai Chai as I type this and it’s pretty yummy. PS: If you want to try your hand at making your own rosewater – check out this post: DIY Rosewater. This looks like a lot of fun, even for us “white” girls. I know my grand kids would love these drinks. They are so pretty! Your photos of the drinks are fabulous! 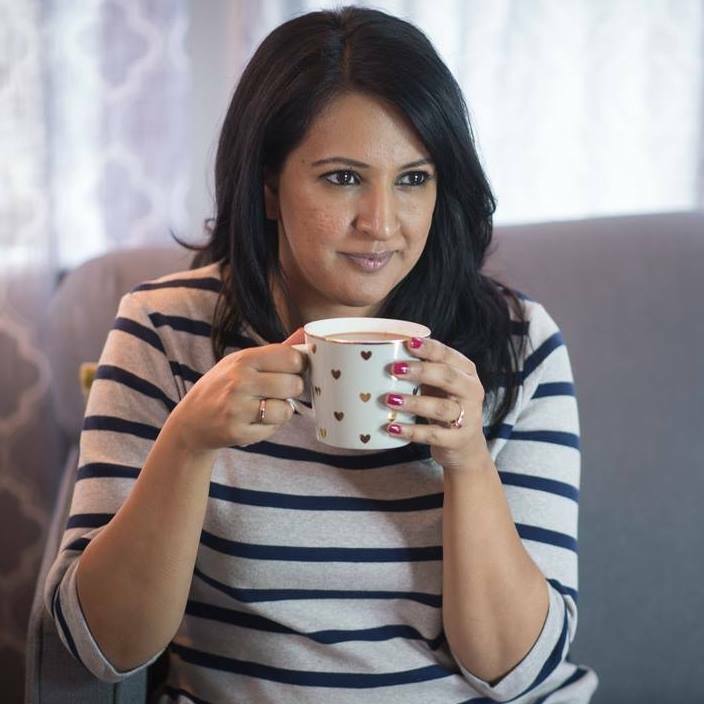 Will there be a Pink Chai Living Cookbook coming out in the future?